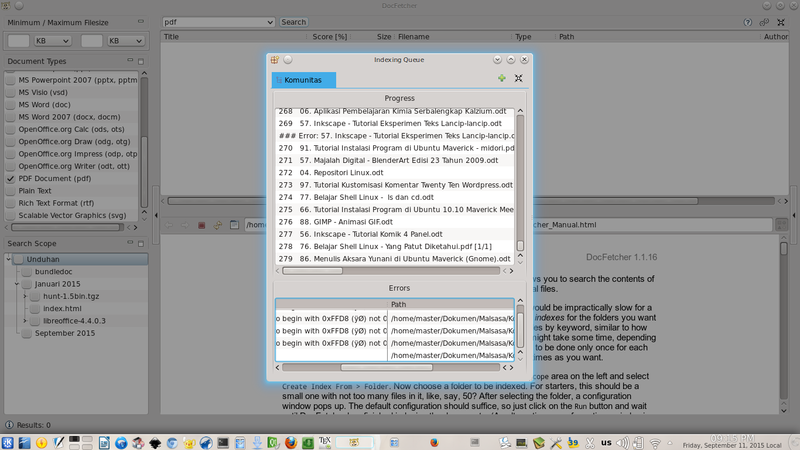 Are you looking for Google Desktop in Linux? Google never release that program for Linux. Instead, we have an alternative from DocFetcher. It is a great replacement for Google Desktop with more features such as selecting what type of file to index. We can select what folder to index, what filetype, and view strings found in every file. DocFetcher can show search result in a table so you can search for a string in all PDF you have. Here we show how to install in Ubuntu and how to use it. DocFetcher official site is http://docfetcher.sourceforge.net. Thanks to qforce for providing DocFetcher. 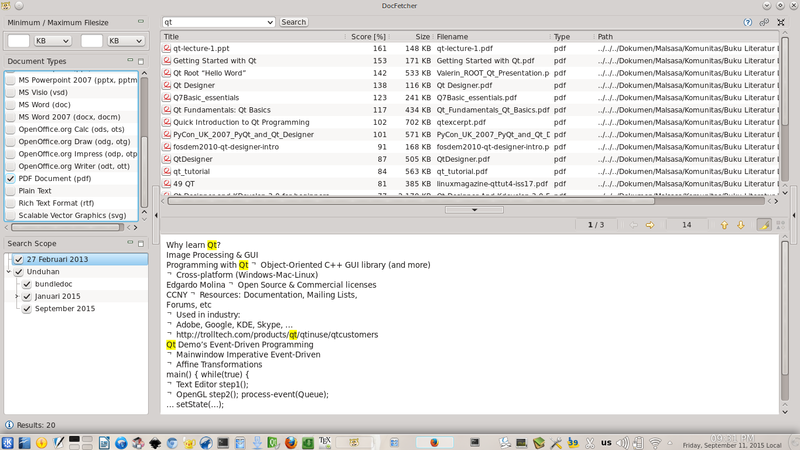 Download DocFetcher Portable from http://docfetcher.sourceforge.net/en/download.html. you will get a ZIP archive contains DocFetcher programs. That is Linux version. Extract the ZIP file. Open DocFetcher folder. As an example, I will show you how to index PDF and HTML files from my personal folder. I want to search through all PDF and HTML files I have. So I need no Google again (and no internet again of course) to do searching. Right-click on bottom-left panel > Create index from > Folder > select a folder you want to index. I choose my personal folder contains PDF and HTML. In indexing configuration dialog, press OK.
DocFetcher will fetch them all and save them to index. This is your "Google Database". To search, type on the most top text box > Enter. DocFetcher will show you all PDF or HTML contains string you've entered. Just like normal googling. As a bonus, you can read PDF or HTML file inside DocFetcher on the bottom panel viewer. On picture below I show you searching for string "qt" to all PDF files I have. As a result, a table contains list of files showed. It is just like googling. It is very easy. Enjoy.